Politicians – They’re Just Like Us! Sometimes we are really hard on our politicians. I mean, come on guys, they’re people too! Sure, many lie, cheat, and steal from the country. The whole “there’s no I in ‘team‘” saying is completely lost on most of them. But beneath that lying, cheating, bratty exterior are people, with real feelings. Because politicians – they’re just like us! They’re forced to wear dorky costumes that someone told them looked “amazing” at the time! They sported bad haircuts in the 80’s and had jungle-themed bedrooms! You're a tiger, Imran!! Growl! Rawr! They think fuzzy animals are just SO adorable! "Gimme the panda!! Give him to me!" "No he's my fuzzy wuzzy bear!" "NO! MINE!" They really do love their pets! "Aren't my lions AMAZING?! 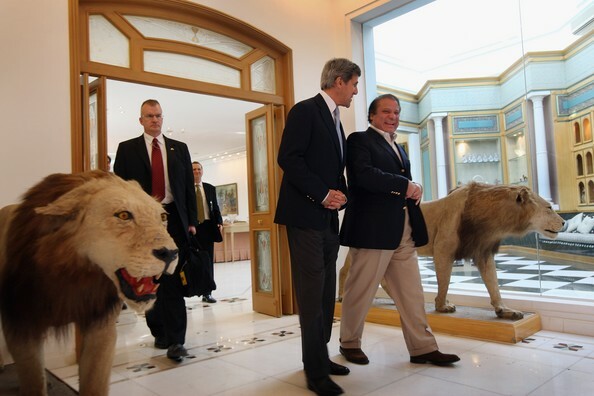 I call that one Nawaz and the angry one's Shahbaz." "If you insist, I might hug. No, really. Insist." Or a big, fat, kiss! "Come give your Altaf Bhai a smoochie!" "Oh. God." So next time you rag on your seedy politician, remember – they’re just like us! …the PPP has opted for a dangerous path of confrontation. Nawaz Sharif, who himself is guilty of increasing bellicosity in recent weeks, immediately upped the ante further by coming out with extraordinary allegations against President Zardari. Where we go from here is anybody’s guess, though it’s safe to say that little good will come out of it. There are several immediate worries. The PML-N may take to the streets in Punjab and threaten a severe law and order crisis. The lawyer’s long march may now culminate in violent confrontation. The federation may feel the strains of pitting the largest province against the center. And on the back-burner may go the country’s serious crises of militancy, the economy and governance. Democracy is not dead in Pakistan, but common sense may be. The Nation’s editorial noted, “The dreams for a tolerant political culture and a viable democracy have been shattered. With uncertainty gripping the country, questions are being raised if the government would be able to complete its tenure.” In the Nation’s opinion, Zardari “needs to seriously weigh the consequences. He alone is in a position to call the ugly standoff to a halt. 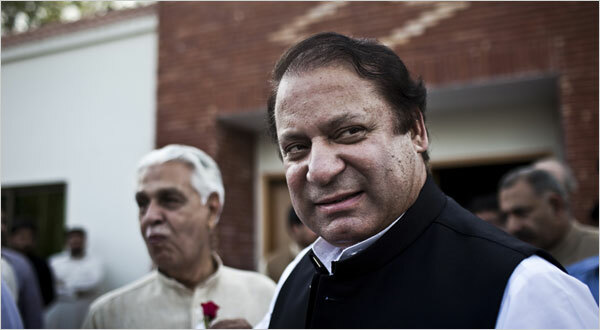 For this there is need on his part to employ whatever legal, constitutional and administrative means are available to him to undo the disqualification of the Sharifs and maintain the PPP-PML(N) alliance in Punjab.” In the recent issue of the Friday Times, Dr. Hasan Askari-Rizvi, echoed, “If the PPP-PML(N) confrontation spills over in the streets in the Punjab and Islamabad, both will lose and the future of democracy will become more uncertain. If democracy falters under these circumstances the major blame will be on these political parties.” Oh, the irony – “democracy” damaged by its own actors? Everyone wants justice in Pakistan including the deposed chief justice Iftikhar Mohammad Chaudhry, the lawyers, Mukhtaran Mai and ordinary people. However, the only group that eventually got the government to agree to implement a system of justice they wanted – and popularly called the Nizam-i-Adl – is the Swati Taliban. So, the moral of our story is that justice will be granted to the most brutal bidder. That may be a good albeit depressing thought to leave on. Happy weekend everyone. Here’s to hoping – for the people’s sake – that things don’t unravel further. On Wednesday, Pakistan’s Supreme Court nullified last year’s election of Punjab’s chief minister, Shahbaz Sharif, and “also declined to rule on a challenge to an electoral ban on…former prime minister Nawaz Sharif, effectively maintaining a bar on him standing for election,” reported Dawn. GEO and AAJ News reported that Punjab governor Salman Taseer will assume executive control over Punjab province for the next two months. Supporters of the PML-N took to the streets today to protest the decisions. According to AAJ Television, “An angry mob of some 800 people gathered on the main Mall Road in Lahore, blocking traffic by burning tires and chanting slogans against President Asif Ali Zardari. Witnesses said the crowd, including women supporters, attacked banners of the main ruling Pakistan People’s Party and tore down hoardings carrying pictures of the president, prime minister and the provincial governor [Taseer].” Similar protests took place in Multan and “more than a dozen cities and towns” in Punjab province, reported the news agency. The Sharif brothers, especially Shahbaz, are very popular in their provincial stronghold, and protests are likely to continue over the next few days. For further background on the judiciary movement and the Nawaz Sharif controversy, read the articles tagged in this CHUP category, particularly this article.